At least back then cooling was considered-and is-a negative to the human condition on this planet. Now, everything is upside-down. Hey Jeff, more than 100 years ago the CO2 warmists thought completely different. BTW- What is the ideal global average temperature of the earth? Why can’t tornadoes be accepted for what they are, a normal springtime happening in much of the US, instead of being tied to every kook’s interpretation of “climate change”. We went nearly 40 years without a huge tornado catastrophe, probably the longest such stretch in the last 150 years. We were way overdue for one. The highlighted text doesn’t support the full headline. Where’s the evidence that says climatologists are linking the tornadoes to cooling? You have highlighted some text but that is merely a weather observation, the link could be made by the journalist for all we know. There is no evidence here to say the link is made by climatologists, just an unsupported headline. Hengist, back in 1975, the snake oil salesmen circling the public trough didn’t use the self-aggrandizing title of climatologist. It is my understanding that the self-appointed title “climatologist” became fashionable with sandwich boards proclaiming the end is nigh, tin foil hats and the IPCC a few years later. 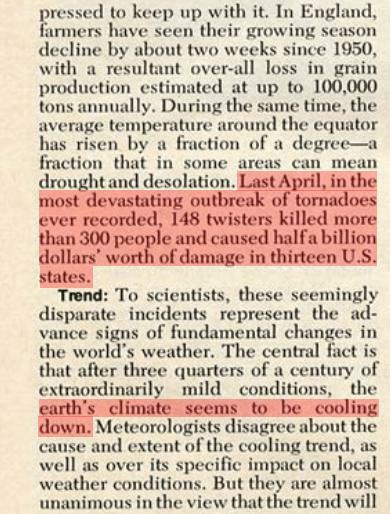 Now, where is the evidence that climate scientists back in the 1970s connected tornadoes with global cooling, as suggested by the headline? It’s not there, ergo it’s a fallacious posting so perhaps the author could trouble himself to withdraw the posting .